For leaders and SYs, it has always been an unconscious, collective lack of comprehension/denial that Shri Mataji didn't care for their protocols and rituals, that it was nonsense for Her. As far as they were concerned, the SYSSReligion was all they had to show/convince themselves and others that they were practising a unique method of meditation, and the proof was in their protocols (of worshipping Shri Mataji) and rituals (of clearing and cleansing the subtle system). All the knowledge about chakras, nadis, location, cures and so forth that has been gathered by SYs for more than three decades are just page 1 out of 108. This collective knowledge so prized by ignorant SYs is just the first letter"A", the very first letter you learn. This is just the first week of kindergarten ....... and nothing more. Page 2, or the letter"B", or the second week of kindergarten begins with Silence on Self as you gain pure knowledge of God Almighty while participating in the Resurrection and Last Judgment declared by the Comforter sent by Lord Jesus ........... and continue thus for the rest of your life. 99% of SYs are in the first paragraph above. The remaining 1% are with us here in the second .................. and chakras, locations etc., are the last thing we want to know as that would mean going backwards into ignorance, fear, superstition, guilt, confusion, obsession, rituals, external attention and petty knowledge i.e., the Sahaja Yoga Subtle System Religion that 99.99% of newcomers have fled over the last three decades, are fleeing now, and will always flee in the future. Without question there is no room here for the SYSSReligion ....... absolutely no room whatsoever! 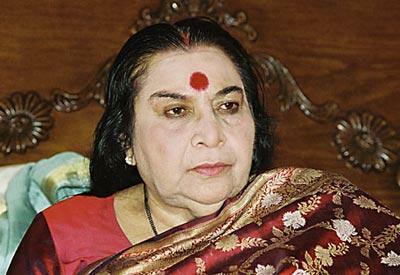 The incarnation of the Divine Mother, Shri Mataji, declares that “I don't care for your protocols and rituals. It is nonsense for me.” i will not insult myself by including the Divine Mother. And for all SYs so conditioned by the SYSSReligion Page 2, or the letter"B", or the second week of kindergarten begins with Silence on Self as you gain pure knowledge of God Almighty while participating in the Resurrection and Last Judgment declared by the Comforter sent by Lord Jesus ........... and continue thus for the rest of your life. The protocols and rituals of the SYSSReligion are nonsense, and you will follow this entrenched corruption and mindset at your own peril! Ulysses Press, 1995, p. 51. There is little difference between the above repeated warning by Jesus and mine i.e., do not entrust your spiritual development and well-being to others, be they WCASY priests, politicians like Sir C.P. or Kalki prophets named Ishmael and Richard Embleton. And if i have to repeat this warning hundreds of times over the years i will most willingly. It is indeed a blessing to enjoy the solitude of a clear conscience than the collective joy of liars, fools and hypocrites. Period! Note: For the first time ever Shri Mataji is not having a Christmas Puja. So the 2008 Guru Puja speech is indeed Her last and final farewell after more than three decades of a life dedicated to a selfless, relentless and fearless dedication to fulfil Her duty, pledge and role as the Adi Shakti and Comforter - the promised bearer of the Great News of the Resurrection. Why should the Divine care about those who are spreading the nonsense of the SYSSReligion?